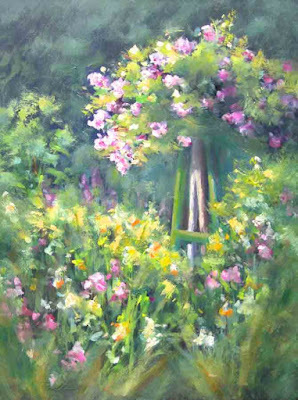 Created a larger painting of the same scene from Monet's Garden shared the other day. 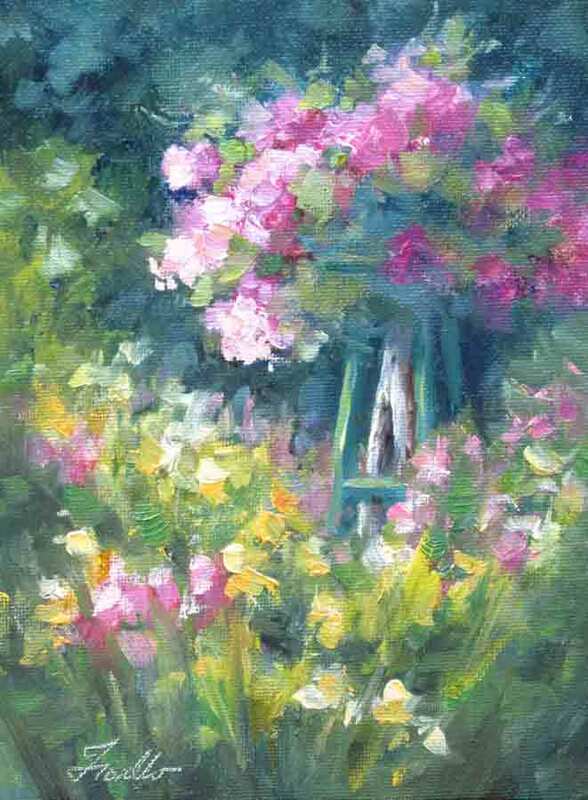 I actually did this one before I did the small study ( which has already sold), but painted this using a totally different approach. I had a canvas which I had started a different painting on months ago. It had some dark shapes for glass bottles laid in but I never got around to finishing that scene and kind of lost interest in it, but had the underpainting on this canvas hanging around the studio, reminding me to complete it. Rather than paint something I was no longer excited about, I decided to let go of that earlier direction and I repurposed the underpainting for something I was excited to paint. 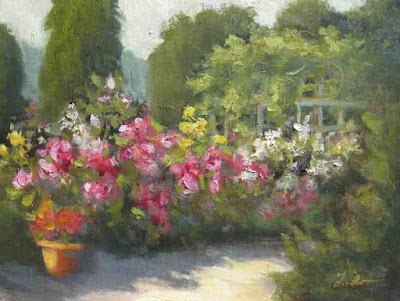 I went very dark with the underpainting for this and then pulled this sunlit garden scene out of the darks. 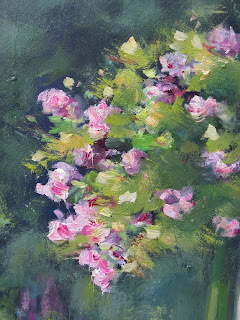 Below is a close up of some of the brushwork on the arbor roses. The lesson in this, better to paint what you are excited about than to complete something I started that my heart was no longer in. I am happy with how this painting turned out and relieved to be free of that unfinished canvas that I was making myself feel guilty about. Unlikely that anything special or beautiful would come out of "should", but the odds are much better with what if.... or I can't wait to.... If you're not feeling a connection with your inspiration, it's time to move on. 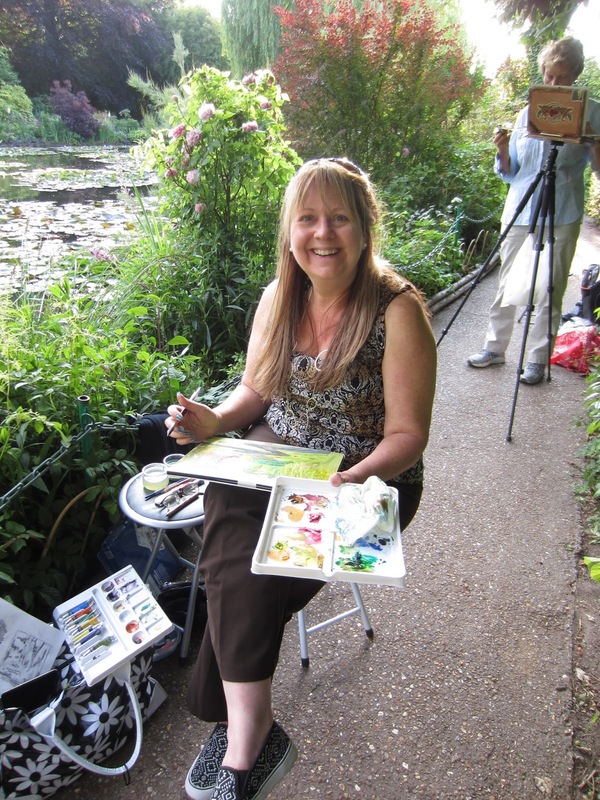 Starting to work on a series of paintings from my recent trip to Monet's Garden. I went thru almost 1300 photo's from the trip and culled them down to the top 20 favorites to focus on for the series. This scene of a rose arbor in the sunlight was a favorite. Started with a small 6 x 8 study to warm up. Plan to do several larger version with different techniques. 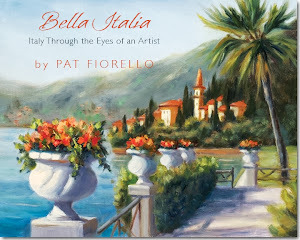 Will post the paintings from the series as it unfolds over the coming weeks. Here's the finished oil painting demonstration of up close roses from last week's workshop. Being in the heart of impressionist country, we focused a lot on light and shadow, warm and cool colors, hard and soft edges and, of course, can never remind my students too much, VALUE is where it's at. If you miss that, none of the other elements will save the day. Plein air sketch, quick impressions of the many greens in Monet's pond. Painted on location. 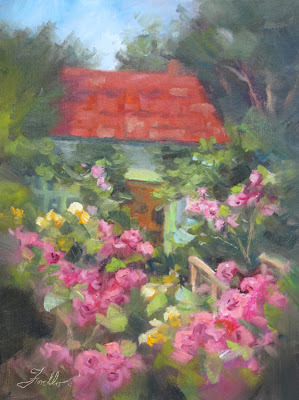 Demonstration painting I did in watercolor of the same location from the Hotel Baudy garden I posted earlier this week in oils. Painted on location in the gardens of the historic Hotel Baudy in Giverny France. 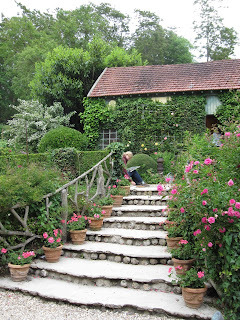 This was a hotel which many impressionists stayed at including Cezanne, Sisley, Renoir, Mary Cassatt etc.. Today it is a restaurant, but still has the old painting studio in back and a lovely garden with many inviting scenes to paint. Here are some images form the hotel and the small studio in the back of hotel that was used by artists back in the late 1800's, early 1900's. They have kept it as it was so it's pretty neat to be in there where some of these famous artist were before. Had quite an eventful week. 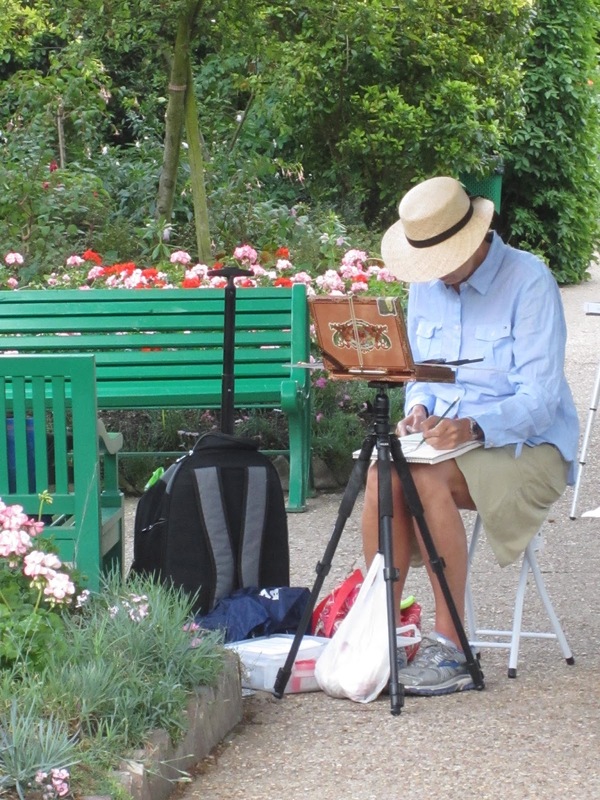 I taught a painting workshop in Giverny, France. My students and I had special access to paint in Monet's Garden. Each morning at 7AM and in the evening after the tourists left we were able to go in and take photo's, paint, soak in the beauty and serenity of it all. We also painted in other locations in the charming town of Giverny and went on some fun excursions including a boat ride on the Seine river on a replica of Monet's "floating studio", a field trip to see his home and the famous church at Vetheuil which he painted many times and a Degas exhibit at the Impressionist Museum. One of the unexpected opportunities was for all of us to participate in the "Fete de la Peinture" which is an annual festival of painting, essentially a plein air paint- out competition. 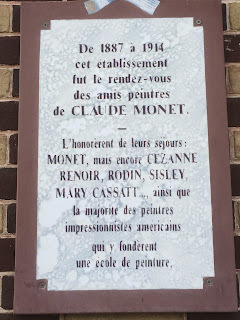 We had our canvases stamped in the morning and had to return in the afternoon to a park where the paintings would be judged. 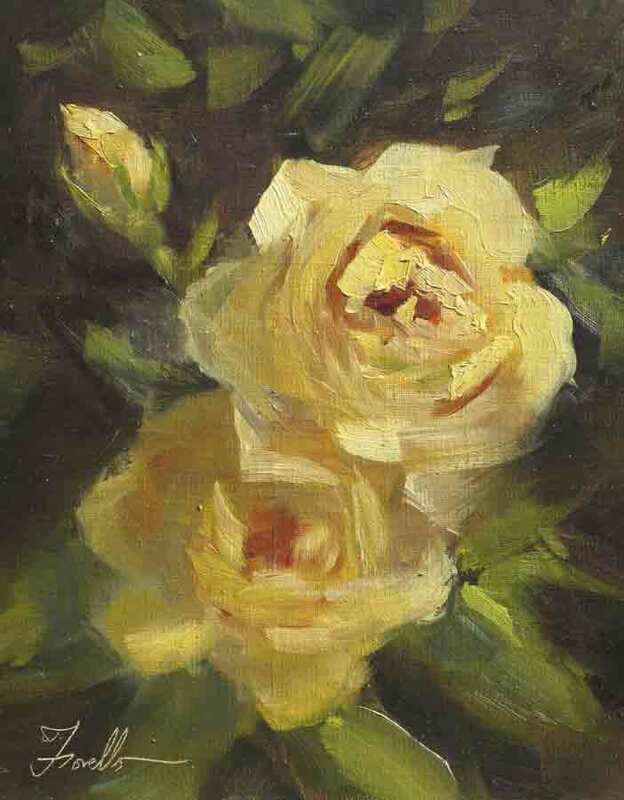 I was doing a demonstration for some of the oil painters in my group for the better part of the day so just had about 2 hours before the deadline to come up with something to submit. I chose a view of this painting studio which is behind the Hotel Baudy, a local landmark where many artists including Renoir, Cezanne, Mary Cassat and Sisley stayed during painting trips to Giverny. 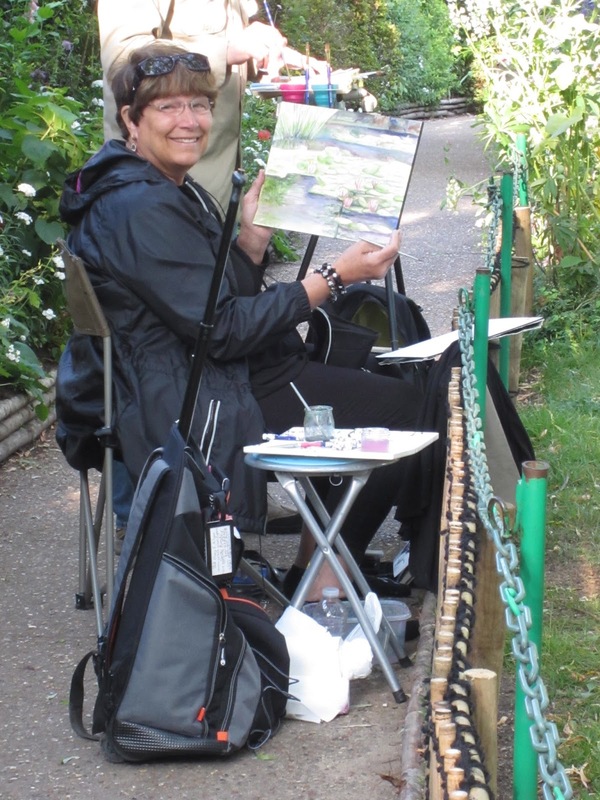 At 5pm we had to bring our paintings on our easels to the park to be judged. Once the judging was over we were asked to carry our easels to the Mayor's office, a few blocks away for the awards and a reception. The Mayor began speaking ( in French, of course) and I had no idea what he was saying till he called out my name. 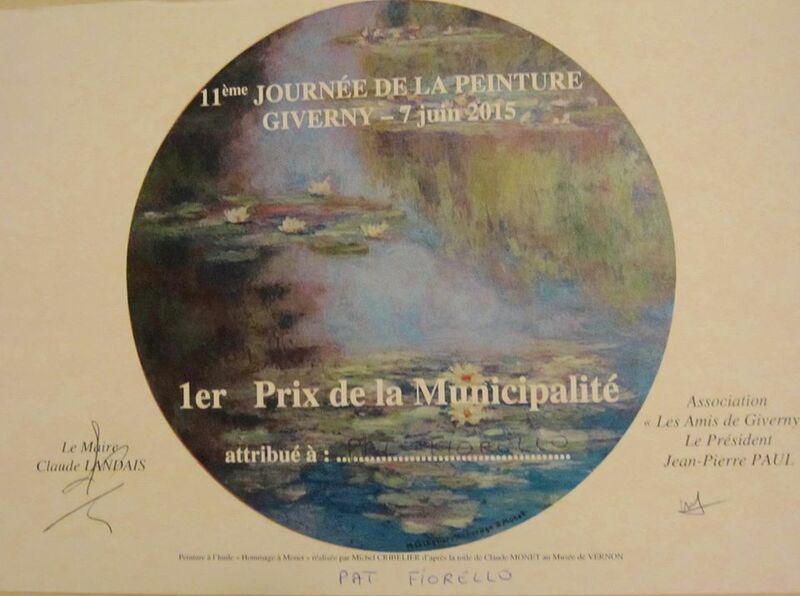 I won first prize in the competition which includes an invitation to have an exhibit back in Giverny in October. 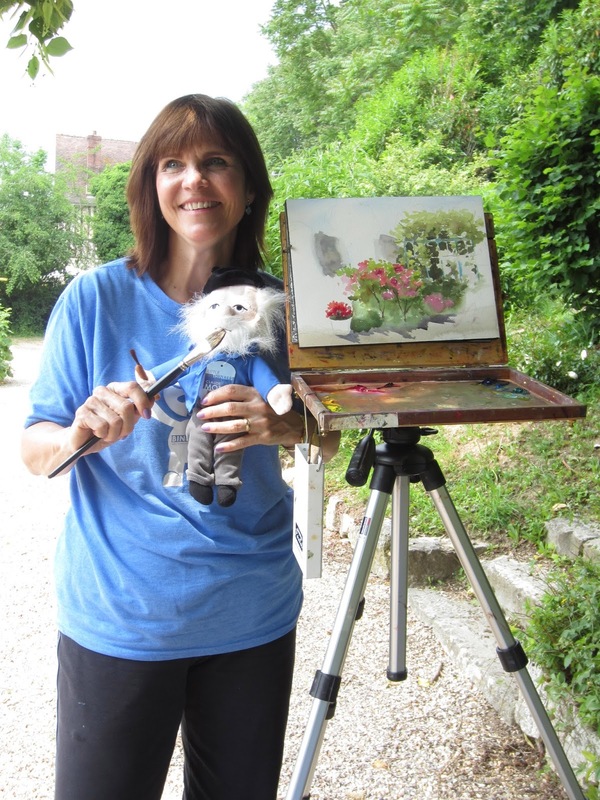 A very exciting moment topping off a wonderful week of painting, fun and inspiration in France with my students. Some long held- dreams come true!